Swans Stats: Are you smarter than Lawro? Are you smarter than Lawro? 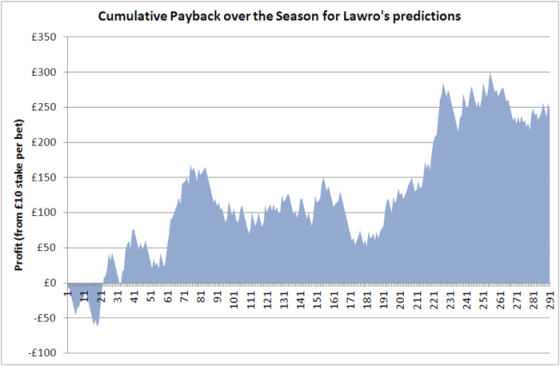 Back in Dec 2012 I wrote a blog looking at how Mark Lawrenson's predictions were making a profit, this was also reported on by BBC's More or Less showing he was still ahead of the market at the end of the season. I've had a look to see how he's been getting on this season to see if this wasn't just a one season wonder and if he makes better choices with football predictions than he does his shirts on Match of The Day. To do this I've taken his predictions as collated on the excellent My Football Facts and matched that with the odds data available at Football-Data (odds as at Friday afternoon, or afternoon before for midweek games). For the 291 games played in the Premier League so far this season (to 20th March), Lawro has correctly predicted 155 (53%) of the outcomes, but the key will be is this enough to make a profit? Based on a £10 stake on each of the 291 games, Lawro's selections would have given you a profit of £242.20 if using just Bet365 (the first of the odds makers on the Football-Data list), £246.40 if using Pinnacle (generally the best priced bookmaker) or £287.30 if you had accounts with all 8 of the bookies quoted and picked the best odds for each selection. Bet365 had an average market of 102.5% (Pinnacle 102%) where using the best odds gives you a market of 100.7% and a 'perfect' market would be where the probabilities of the Home/Draw/Away odds would equal 100%. As for last season, greatest part of the profit is where Lawro picks a draw. 36% of these selections were correct where odds provided suggested only 29% should have been draws. All of the above suggests a 'wisdom of the crowds' and that markets are priced accurately but it might well be (as suggested last season) that Lawro is more willing to sit on the fence than the average punter and that (either deliberately or not) Lawro is exploiting an inefficiency in market where the Draw is over-priced. 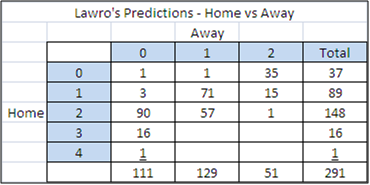 71 out of the 73 predicted Draws from Lawro he's predicted as 1-1 and has only predicted 1-0 or 0-1 scorelines 4 times in the season compared to the 58 times it's happened in the 291 games so far this season. At first glance it might look odd to put so many draws down as the same score but actually this has been the most likely score for a draw this season so actually makes sense if you're going for a 'quick and dirty' approach, although 1-0 has been more frequent than 2-0 maybe 2-0 sounds more decisive. Lawro also has particular favourites (or blind sports) which when you look at his predicted table vs. the actual stick out and give the impression he doesn't know what he's doing but ultimately anyone picking on 'gut feel' will have favourites. 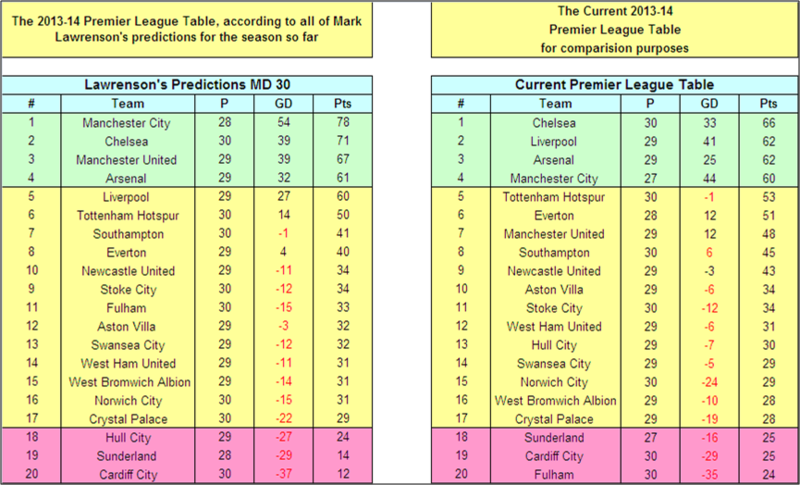 The predicted and actual Premier League tables (via My Football Facts). Man Utd and Cardiff are among the biggest differences but for majority of individual games saying Man Utd would win and Cardiff lose is not that odd a prediction. The above and last season's results show (however it's put together) that Lawro's selections have been profitable over a reasonably long period, but could more scientific methods give even better returns? Over at EPL Index, Neil Charles has been using Opta data to simulate matches to predict likely outcomes, ultimately whether it's reading the sports pages, looking at the league/form tables or building a model like Neil has all of these are cases of taking in information and using it to make an informed decision, even if some methods are less emotionally biased than others. 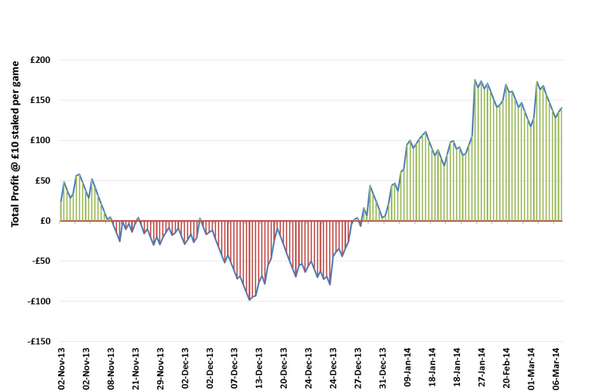 Neil's model has been up and running since November and in that period for a £10 stake per selection with Bet 365 returned a profit of £140.56 (not including last weekend which Neil said was £30 up). Over the same period Lawro's selections also placed at Bet 365 would have returned a profit of £128.40. Analytics can be an improvement but it can also be a lot of work for only small gains. Naturally I'm in the pro-analytics camp but there are rarely easy answers, it needs someone to appreciate the value in those small incremental gains on the bigger picture.